Pictured above are a few gems from our golden age science fiction collection. 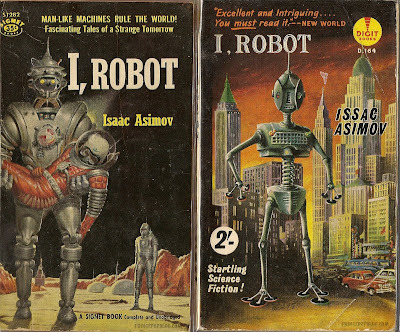 "I, Robot" by Isaac Asimov was a high-spot of that era and remains a classic of the genre. 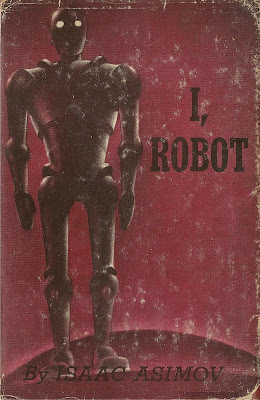 The "red" book is the first American edition of the book from 1950. 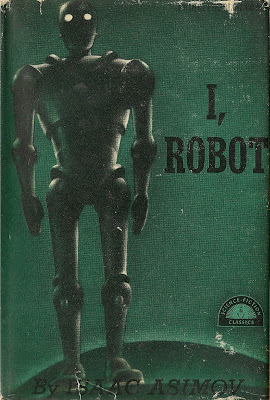 The "green" is the 1952 first American hardcover reprint edition-- same cover as the first American but in a green tone-- a rare printing of the edition. The hardcover with completely different art is the first U.K. edition, dating from 1952. Finally, the two books shown as a group are from left to right are the first American paperback edition (1951) and the first U.K. paperback edition (1954). It's interesting to compare the various takes on robots that the artists employed. The "green" and "red" robots are very stiff, tall and intimidating looking. 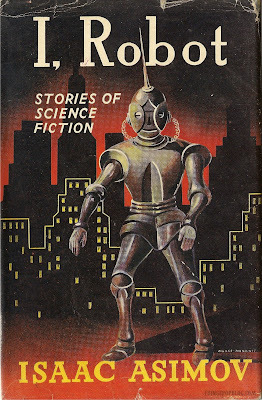 The first American paperback edition has a somewhat more macho looking robot as well, as he is shown as a large figure carrying a human. On the other hand, both the U.K. 1st hardcover and 1st paperback have robots that look kinder and gentler. Does this say anything about American machismo, particularly Cold War posturing? Perhaps or perhaps not. It may just be a coincidence.